Fluorochemicals Market size was over USD 35 billion in 2017 and industry expects consumption of above 4.5 million tons by 2024. Rise in demand for refrigerators and cooling systems in industrial as well as domestic sector due to changes in lifestyle and growth in refrigeration need for convenience food products storage will drive fluorochemicals market size. Global commercial refrigeration market may exceed to USD 65 billion by 2024. Growth in departmental stores, hypermarkets, supermarkets has led to rise in need for proper storage facilities of perishable food products which is likely to contribute toward market growth. Application potential in pharmaceutical industry owing its non-flammable properties may act as key driving factory towards industry growth. It is prominently used as anesthesia in dental care Increase in R&D expenditure mainly in pharma industry to develop novel product range will propel industry growth. Global pharmaceutical R&D spending may surpass USD 185 billion by 2024. Growth in vehicle production which is attributed to rising consumer economic standards will favor product demand for aluminum production. Global aluminum market is poised to surpass USD 245 billion up to 2024. Fluorocarbon mainly hydrogen fluoride is used in aluminum production through electrolysis. Fluorspar is the key raw material for commercial manufacturing. Technical innovations in extraction process may drive industry growth. However, stringent environmental policies by EPA has led to phasing out of these products mainly fluorocarbons to reduce environmental effect. This may incur compliance cost which is likely to negatively affect industry profitability and affect fluorochemicals market price trend. 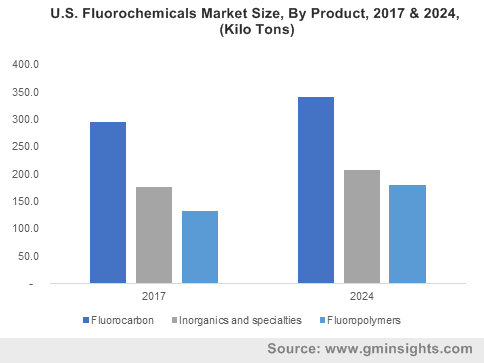 Fluorochemicals market size from fluoropolymers is poised to surpass USD 9 billion by 2024. It has wide application in automotive, semiconductor, aircraft and household appliances. Key properties include high chemical, solvent, acids and base resistance, superior electric properties and non-adhesiveness. Increasing application range in healthcare industry for medicals implants due to excellent biocompatibility will boost product demand in this application. Fluorocarbons market size may observe significant gains close to 3%. It is used in propellants, blowing agents, refrigerants and solvent. Rising concerns regarding ozone depletion may negatively impact product demand. However, major manufacturers are formulating less harmful fluorochemical substitutes which will surge product demand. Fluorochemicals market size from refrigerants application may reach to USD 30 billion in terms of sales at the end of 2024. Increase in consumption of packaged and frozen food has led to rise in demand for commercial cooling systems which may favor industry growth. Moreover, growth in installations of air conditioning systems due to rise in consumer purchasing power will fuel product demand. Fluorochemicals industry size from aluminum production may witness gains close to 2.5%. Lightweight and low maintenance characters have promoted aluminum usage in electronic and automotive application which may propel product demand. Fluorine based chemicals such as AHF are prominently used for aluminum production owing to its cost effectiveness. Asia Pacific driven by India, South Korea Japan and China fluorochemicals market may exceed 2.5 million tons at the end of 2024. Rising installations of HVAC systems in infrastructure and automotive may drive regional industry growth. Fluor Technology products are widely used in construction & building industry to provide anti-corrosion, high durability and UV resistance properties to materials such as architectural membranes and coatings, caulks, and wire and cable. Europe driven by Germany, France Italy and UK market may register strong gains over 3%. Growing healthcare spending supported by R&D on fluoropolymers usage in medicals implants may favor product demand. Presence of major players engaged in product innovation for wide application spectrum will propel regional industry growth. Brazil market may witness strong gains due to increase in demand for commercial cooling systems for effective storage of perishable goods. Rise in development of restaurants and distribution service along with growing need for effective transportation will boost regional demand. Global fluorochemicals market share is competitive and consolidated along with major players including Honeywell, 3M company, Dupont, Daikin Industries, Arkema, Asahi Glass Company, Dongyue Group, Solvay S.A. and Mexichem. Other industry players are Halocarbon Product Corporation and Pelchem. 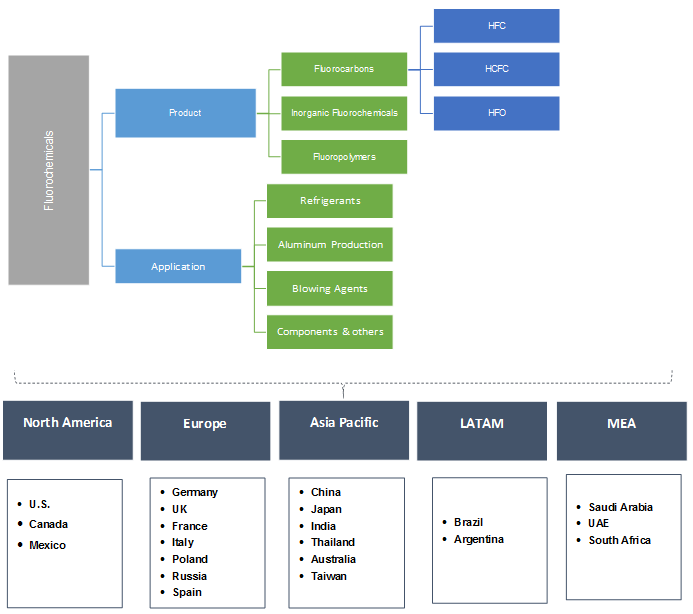 Companies present in the market are driven by technological and product launch to formulate and focus on the development of fluoropolymers for different industrial applications which will surge product demand. Fluorochemicals are the group of compounds which are obtained from mined fluorite. It is prominently used for manufacturing fluoropolymers, fluorocarbons and flour surfactants for varied applications including refrigerants, aluminium production and blowing agent. Rapid industrialization and development of automotive and electronics industry will favour industry growth. Industry is characterized by stringent regulatory amendments which has led to formulation of different environmentally acceptable alternatives which may have positive influence on product demand.